According to a recent survey by GOBankingRates.com, the top New Years resolution about money is to save more and spend less. As financial planners, this is music to our ears. We know that Americans are notoriously bad savers, so this is one that everyone should be thinking about. According to Bankrate.com, 66 million Americans have zero dollars saved. And according to Forbes.com, 69% of all Americans have less than $1,000 saved. On the other side of this, 15% of you have more than $10,000 saved. If you have less than $1,000 saved, please make (and keep) this New Years resolution! The second most popular financial New Years resolution is to pay down debt. This is not quite as important as the first reolution from a financial planning standpoint, but it is a great goal. The average American household had $15,165 in credit card debt in 2015 according to Valuepenguin.com, so this absolutely should be goal number two. If you look at all debt, the average American household has $132,500 including mortgages according to Bloomberg. Just getting those credit cards paid off would eliminate over 11% of that total debt, so that is a great place to start. Be sure to accomplish your savings goals first, otherwise an unexpected financial event could end up adding to your total debt and knock your whole plan off track. 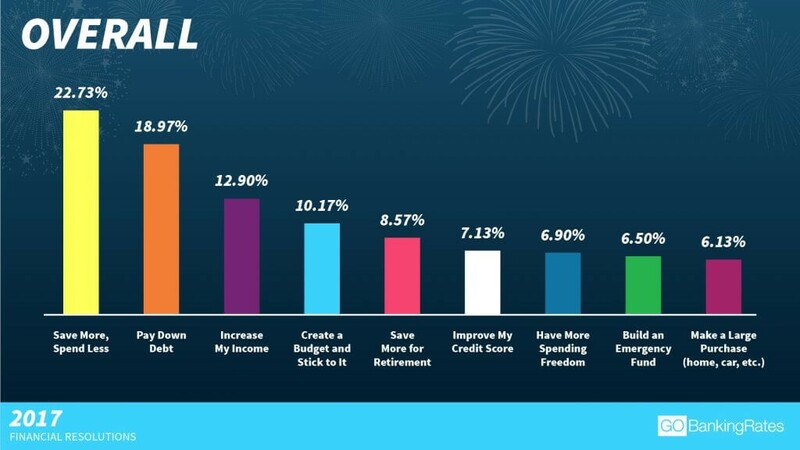 The third most popular financial New Years resolution is to increase income. This is a great goal, and there are lots of ways to accomplish it. Your options here include finding a new, better paying job, something that is becoming easier as the economy improves. According to USNews.com, average hourly pay hit $25.79 in September of this year, an increase of 2.6% from 2015. This is a trend that we suspect will continue in 2017, so now may be a great time to go find that new job you have been thinking about. Some other ways to increase your income include getting a second job, increasing your hours at your current job, starting a home-based business, or going back to school and getting a degree that will increase your earning potential. Going back to college after age 25 is a trend that has been on the rise in recent years. According to a 2014 article on CNBC.com, students age 25 and older accounted for about 40% of total college enrollment in 2009, a figure that is expected to increase to 43% of total enrollment by 2020. That is 9.6 million Americans that will be going to college outside of the “normal” college years, so don’t think you will be the only one! The last five financial New Years resolutions were made up of creating a budget and sticking to it, saving more for retirement, improving credit scores, having more spending freedom, building an emergency fund, and making a large purchase such as a home or car. All in all, despite Americans lack of savings discipline, it seems like those that answered this survey knew all the right answers and had their priorities straight. The real question is how many of them will follow through with their New Years resolutions? According to statisticbrain.com, 45% of Americans usually make New Years resolutions, but only 8% actually achieve their resolution! If you need help achieving your financial New Years resolutions, call us in the office at 904.685.1505. We can help!